Sri Rangadeshik Swamiji was born in the year 1809 A.D to Sri Srinivasacharyaji and his wife Ranganayaki devi at a small village called Arahan near present day Sriperumbudoor. 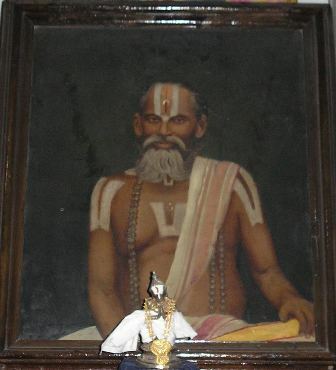 He also had two brothers by the names of Sri Parthasarthy and Sri Venkatacharya. He lost both his parents at a very tender age and was brought up by his maternal grandparents. As was the wont in those days when he reached eight years of age his Upanayana (sacred thread ceremony) was done and formal education of Vedic scriptures was started. In a very short period of time he mastered all that was taught to him and started yearning for more. One night in a dream he was chased by a bull, in whichever direction he went the bull also chased, but when he turned towards north the bull stopped chasing. Interpreting this to be a divine indication asking him to move northwards, he went to Kanchipuram. There he met Sri P.B. Anantacharya Swamiji, once a great scholar came for a verbal duel with Swamiji and the young Rangadeshik defeated him. Sri Anantacharya Swami was highly impressed and brought him to North India when he went there for pilgrimage. In a very short time Swamiji established himself as a scholar of great repute and continued propagation of SriVaishanavism doctrine. SriRadhaKrishnaji belonged to a very rich business family of Mathura, who were followers of Jainism. Due to God's grace he got attracted by SriVaishnavism philosophy and approached Swamiji for discipleship. Later, his younger brother SriGovinddasji also got initiated into SriVaishnavism by Swamiji. Both these brothers were very impressed by SriVaishnava temples in South India and expressed their desire of worshipping SriGodaRangamannar with Sri Ramanujacharya in North India. Treating this as a divine wish, Swamiji showed them the map of SriVaradaraja temple of Kanchipuram and asked them to construct a temple on similar lines. Artists and craftsmen were brought in from Kanchipuram and construction of temple was started in the year 1843 A.D. and got completed in the year 1850 A.D.
By now Swamiji's reputation had spread all over India and he was often invited to clarify philosophical doubts and settle religious debates. Once a great debate happened in the court of Maharaja of Bundi in south Rajasthan, where Swamiji defeated all others and establisehd the greatness of SriVaishanvism doctrine. The Maharaja was very impressed by Swamiji's erudition, he felicitated Swamiji by presenting a highly valuable jewel studded sword and also asked to be made his disciple. He was followed by several other kings and noblemen.Once Swamiji went to Kanchipuram and there also he was engaged in a debate for 18 days, after which one of his chief disciples SriSudarshanachari Shastriji came out victorious. From there whereever Swamiji went, he established the supremacy of the path shown SriRamanujacharya and other great acharyas of SriVaishnavism. Swamiji travelled across all over Northern India was chiefly responsible for the revival of SriVaishanavism in north India. All his life Sri Rangadeshik Swamiji remain devoted to the worship of Lord SriVenuGopalji. Everyday he would personally fetch water from SriYamunaji for worship of SriVenuGopalji. Later as his time to leave for SriVaikunth approached, he gave up all his worldly attachments, survived only on fruits and completely devoted himself to the worship of SriVenuGopalji. Swamiji left for SriVaikunth on 10 day of Chaitra Shukla paksha in the year 1873 A.D.